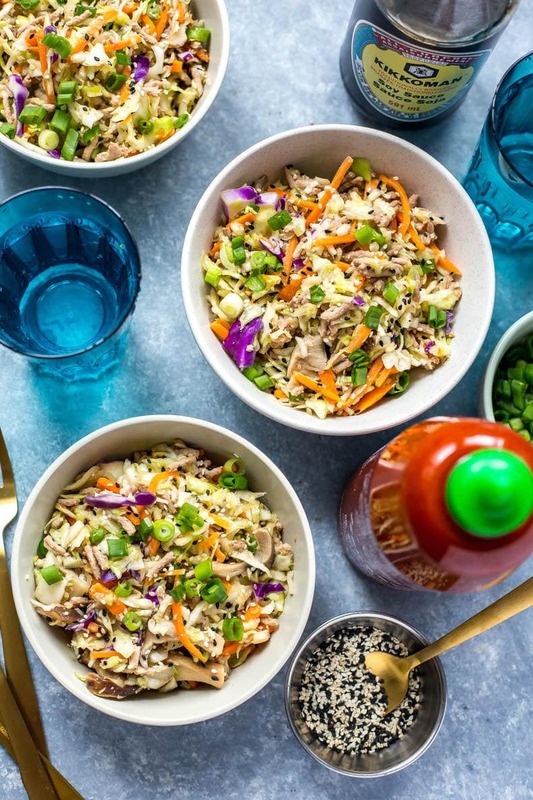 This Low Carb Instant Pot Egg Roll in a Bowl with ground chicken and coleslaw mix is a delicious Chinese takeout-inspired dinner idea that comes together in less than 30-minutes! Get ready for the easiest one pot weeknight dinner evaaaaaaa! 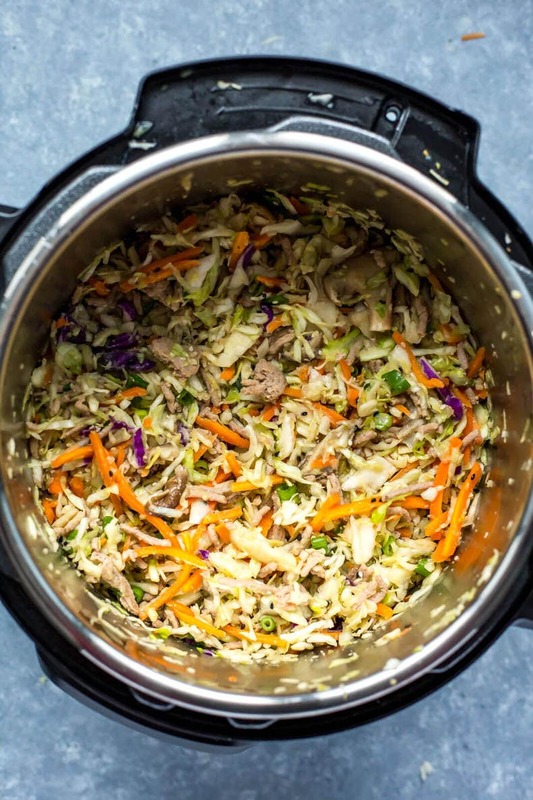 This Low Carb Instant Pot Egg Roll in a Bowl is a delicious, easy dinner idea that comes together with the help of your pressure cooker – I've done a version of it on the stovetop (what I deemed Potsticker Bowls) but the Instant Pot version is so much easier and honestly makes lunch prep so easy. I mean really, I think the Instant Pot is just MADE for meal prep. You dump everything in a giant pot, then the cooking time is completely hands free. The only way you can ever replicate that is with the slow cooker or a sheet pan meal, but as we all know the oven uses up so much hydro and takes a while to preheat, and the slow cooker is, well, SLOW. If you want dinner ready to go in less than 30 minutes with no attending to it during the cooking process, then the Instant Pot is where it's at! 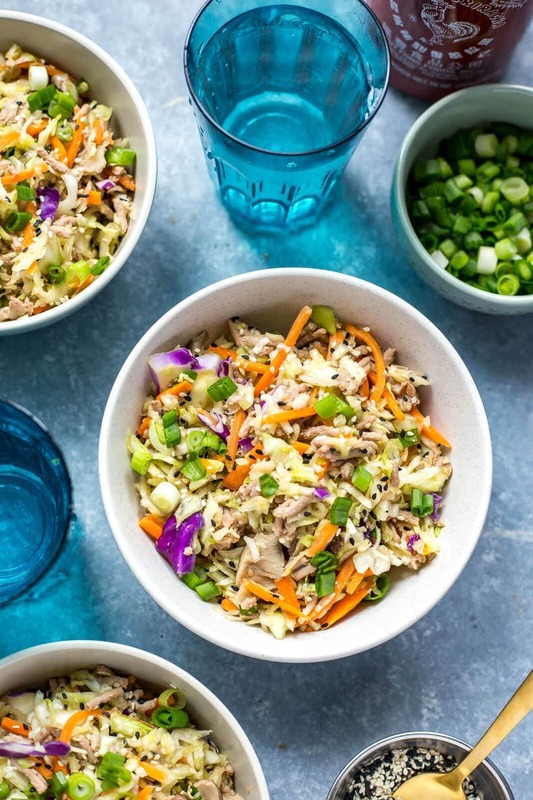 This Low Carb Instant Pot Egg Roll in a Bowl is a simple mix of ground chicken (you can use ground turkey, pork or beef too) along with two bags of coleslaw mix, mushrooms, some green onions and pantry staples like sesame oil, soy sauce, chicken broth and sesame seeds. 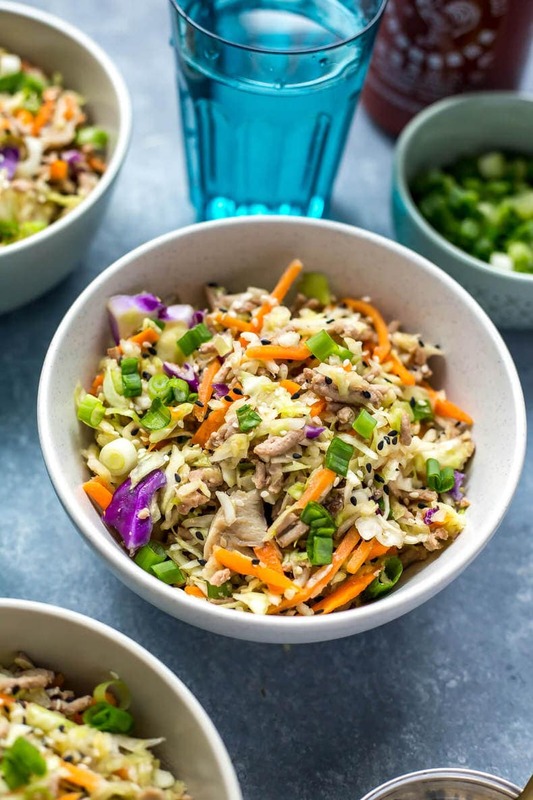 If you're looking to add some grains to this Instant Pot Egg Roll in a Bowl, you could add in some jasmine rice or quinoa and a little bit more broth – in this case, I would say 2 extra cups of broth and 1 cup of rice/quinoa would suffice, but honestly these bowls are so filling you won't even miss the carbs! 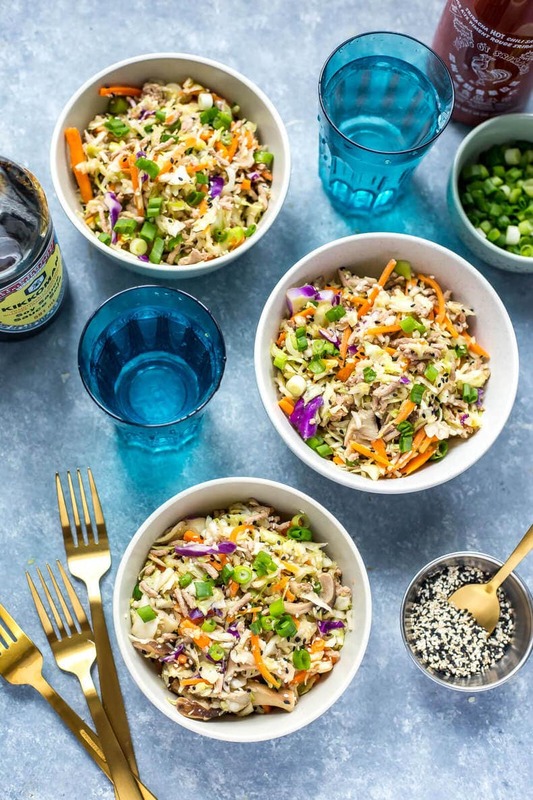 They're such a creative way to enjoy “takeout” at home and you'll be surprised to find out you probably already have most of the ingredients on hand at home! Now there is a technique to making this Instant Pot Egg Roll in a Bowl so be prepared to take a couple extra steps other than just dumping everything in the Instant Pot. But it isn't hard or time consuming, I swear! 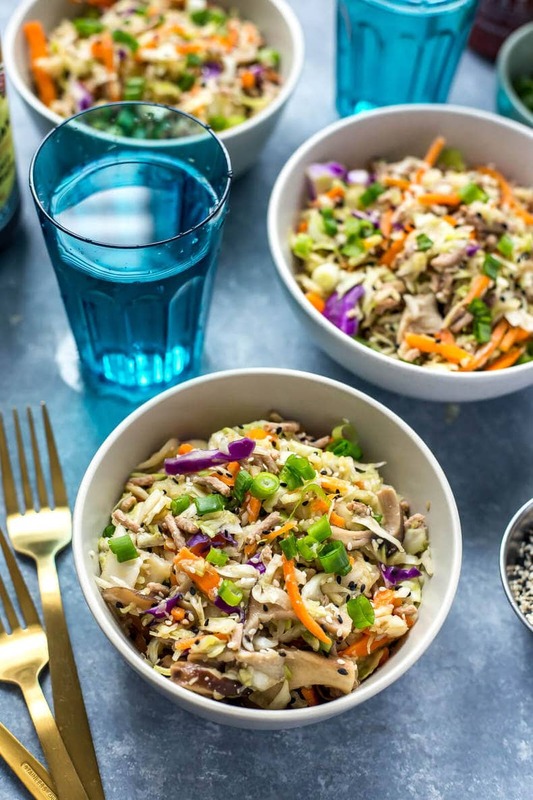 You basically cook the ground chicken with a bit of chicken broth, sesame oil, soy sauce, garlic and mushrooms – you'll need the broth in the bottom to keep the chicken moist. From there, you'll stir in two bags of coleslaw mix and your green onions, along with your sesame seeds. Throwing in this much raw cabbage will cause the food to be cold in the end, and you're partially right. 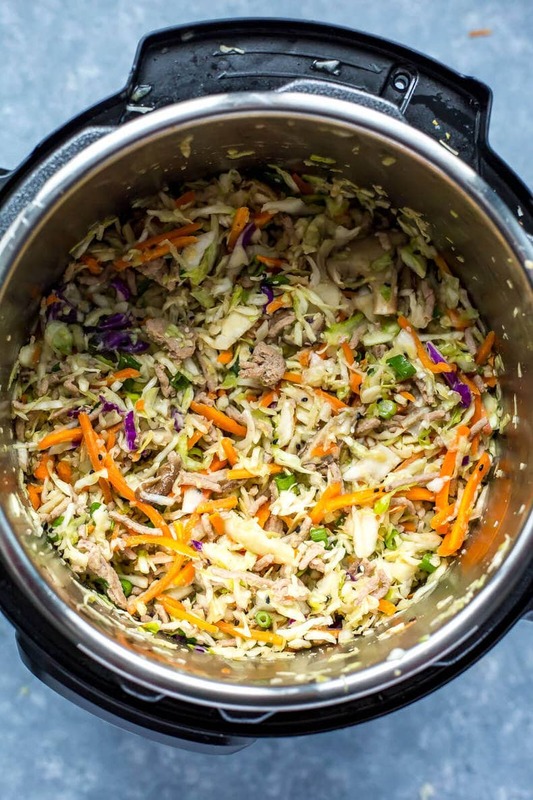 The hot chicken, mushroom and broth mixture really only semi-cooks the cabbage mix, but that's what allows this to be such a super quick and easy one pot meal. Once you've got everything mixed together and have let it sit for about 5 minutes, you're going to want to microwave each serving size for a minute or two just to get everything piping hot. But hey, it's way better than overcooked, shrunken up cabbage right? 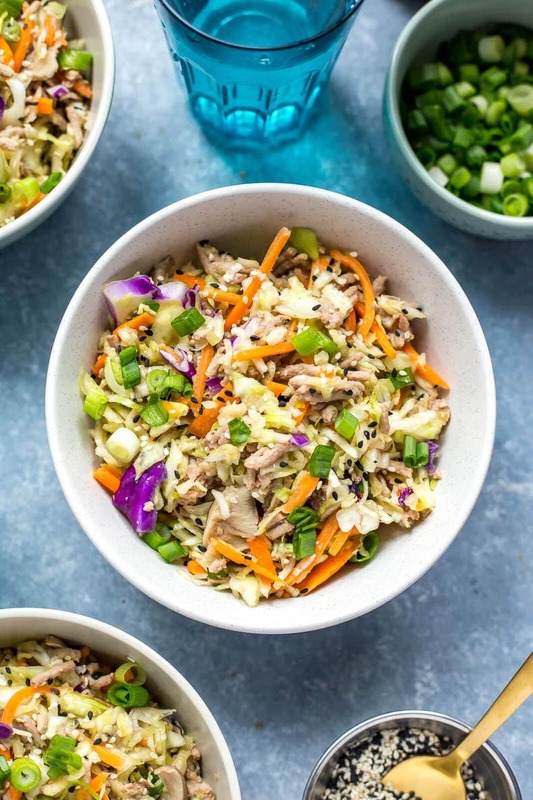 I will admit, if you only like your veggies tender crisp and not super thoroughly cooked, this Low Carb Instant Pot Egg Roll in a Bowl probably isn't for you. But I really do like my veggies only slightly steamed, and I've heard they retain a lot more nutritional value when cooked this way so it's up to you to decide what you like. 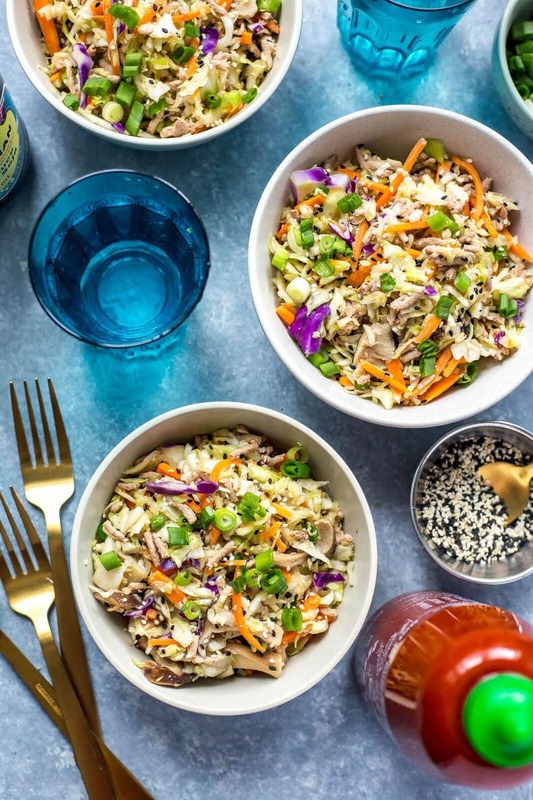 If you still have your heart set on making a stir fry in the Instant Pot, these Instant Pot Chicken Fried Rice Bowls are probably right up your alley, so here's an alternative for you anyway! 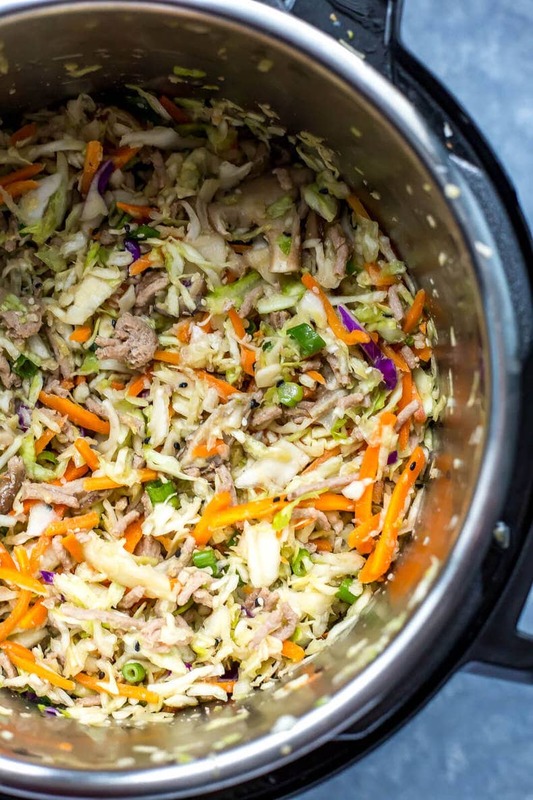 Will you be making this Low Carb Instant Pot Egg Roll in a Bowl? 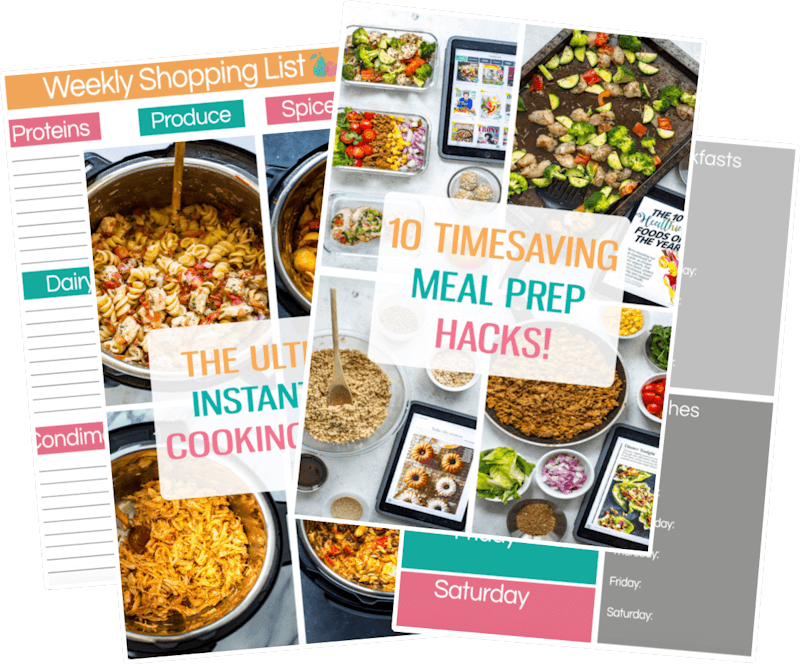 This is the quickest, easiest way to make a delicious stir fry hands-free and I can't wait for you to try it!!! Add sesame oil, soy sauce, ground chicken, garlic, mushrooms and chicken broth to Instant Pot in that order. Cook on high pressure 2 minutes. Instant Pot will take about 10 minutes to pre-heat and then the 2 minutes to cook. When complete, press cancel and do a quick release of the steam, waiting until the pressure gauge drops back down and the lid is safe to open. Stir in matchstick carrots and coleslaw mix, stirring well to combine. Replace lid and let sit 5 minutes. Open lid and stir in green onions and sesame seeds then serve and enjoy! Note: While this is a one-pot quick and easy method, you may need to microwave for a minute after serving in a bowl to get the dish piping hot (just depends how hot you like your food). Leftovers will keep up to 3-5 days in the fridge. One ingredient is 2 bags of coleslaw mix. How much coleslaw mix is this:? How many ounces are in a bag of the coleslaw mix you’re using? Thanks for the recipe, I’d like to try it. What size coleslaw bag mix did you use? Usually it’s a 397g bag! do you have plum sauce? Hey Myrna..Are you asking if I have a plum sauce recipe? Unfortunately I don’t if that’s what you mean! Sorry! do you have the cook time for a crockpot? Unfortunately I don’t Julie – I’ve only made this in the Instant Pot. If I had to guess, cook the meat and mushrooms on low for 6-8 hours and then stir in the coleslaw mix after. But that’s only a guesstimate! Do you put raw ground chicken or cooked ground chicken for this recipe? It’s raw! Whenever you pressure cook something it cooks really quickly. Have you ever frozen this after making it? I’m a fan of leftovers but my SO isn’t and I fear this might go bad before I eat it a all. It’s cheap so I not the end of the the world if it’s not eaten, but if you know if it freezes ok I’d do that. Even if I freeze it to use in something else. Thanks for rhe tip! Hey Adriane! You could try freezing it but honestly I’m not sure how the cabbage would hold up. The ground meat would probably be fine but the cabbage might get too watery or change texture. Again, try it though because you never know! Have you ever tried doubling this recipe? 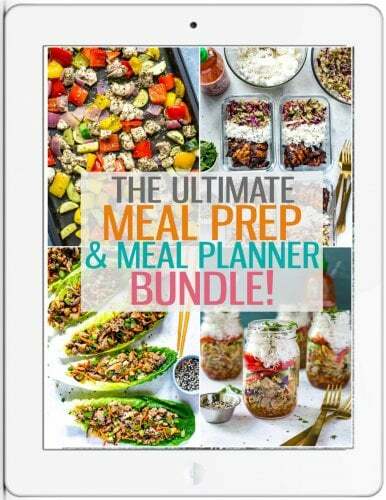 I haven’t but I’ve heard that you can double a recipe without changing the cook time apparently! Hey Milena – the meat should be thawed! Unfortunately I’ve never tried with frozen meat before. This was SO DELICIOUS. It’s pretty much my favourite thing I’ve made in my instant pot to date. My entire family loved it too. Thank you! Have you ever tried shrimp in this recipe? Hey Rob! No I haven’t but it sounds like it would be delicious! I wish I could provide alternative instructions but since I haven’t tried it myself I don’t feel comfortable giving any advice to substitute the ground chicken this way. Sorry I can’t be of more help! Can you use a different oil other than sesame? Like a healthy blend? Is the cook time 2 minutes or 3 minutes? The video shows 3 minutes but the recipe says 2 minutes. There is a typo in the video, sorry about that Amber! It’s 2 minutes cook time.